Weigela florida is a bushy deciduous hardy shrub native to eastern Asian countries such as Japan and South Korea. The exact number of species in the Weigela genus is up for debate, but there are at least seven accepted species out of forty-two possible plant records. Other frequently grown species include W. grandiflora; W. japonica; and W. praecox. As a member of the Caprifoliaceae family, it is closely related to plant genera such as Triosteum (Horse gentian), Leycesteria (Flowering Nutmeg), Lonicera (Honeysuckle), and Symphoricarpos (Snowberry). It was formerly classified along-side Valeriana, and Viburnum. In the garden, Weigela florida is usually grown as an easy to maintain hedging plant at garden borders. It is a dense roundish shrub, and usually spreads wider than it grows tall. It attracts hummingbirds, bees, and brown-tail moths. Old fashioned Weigela is fairly deer-resistant, with plants seldom being completely destroyed by pesky deer. Weigela florida cv Rosa shrub by F. D. Richards. As a popular garden plant, there are many cultivars available; these cover a large array of sizes from dwarf through tall. Cultivars include Midnight Wine (burgundy leaves, pink flowers, 24 to 36 inches (60–90 cm)), Foliis Purpureis (red or pink flowers, 20 to 40 inches (50–100cm)), Bristol Ruby (crimson flowers, 60 to 98 inches (150–250 cm)), Looymansii Aurea (white, pink, red, or yellow flowers (60 to 98 inches (150–250 cm)), Carnaval / Courtalor (this Weigela plant has have three differently colored flowers (white, red, and pink), 48 inches (120 cm)), Minuet (dwarf form reaching 30 inches (75 cm), and Variegata (white/cream edging to the leaves, making it a good plant for all year interest, rosy pink flowers 60 to 80 inches (150–200cm); a smaller cultivar – Variegata Nana is similar but ranges in height from 36 to 48 inches (90–120 cm). Weigela florida is a deciduous shrub that has a rounded shape due to having a wider spread than height. There are many cultivars available but the typical Weigela plant has a range in height of 72 to 120 inches (180–300 cm), and a spread of 100 to 144 inches (250–350 cm). Bark is gray-brown. Branches are course and have a habit of arching to the ground. Green leaves are simple, opposite, elliptic to obovate (egg-shaped), and approximately 4 ½ inches (11.5 cm) long. Leaves are present from spring through autumn / fall. They maintain their color throughout the growing season. The large array of cultivars has led to many other leaf colors including burgundy (Midnight Wine), gold (Rubidor); and leaf edges of white and cream. Weigela cv. Foliis Purpureis in bloom by Leonora Enking. Weigela florida blooms for about two weeks from spring to the start of summer with showy rosey-pink flowers. These appear on smallish corymbs, and are about 1 to 1 ¼ inch (2.5–3 cm) long and funnel to bell shaped. There is often a sparser bloom following the first in the summer. Flowers are followed by a smooth inconspicuous capsule fruit of about one inch (2.5 cm) long, which contains un-winged seeds. Grows well in zones 4 to 8 (hardy to zone 5). Grow in full sunlight for best results. Can grow well in dappled or lightly shaded areas, but flowers will not be as showy. Soil can be average to fertile and fairly moist, but good drainage is required. Can grow in clay soils. Usually, and easily propagated from stem cuttings (softwood or semi-ripe in the summer; or hardwood towards the end of fall and in winter. Seeds from Weigela florida cultivars do not usually grow to form. If growing from seed, sow in trays under a cold-frame at any time of the year. Once sown, cover lightly with sand. Keep the soil in the tray moist. Slow and sporadic to germinate. Space plants at 100 to 144 inches (250–350 cm). 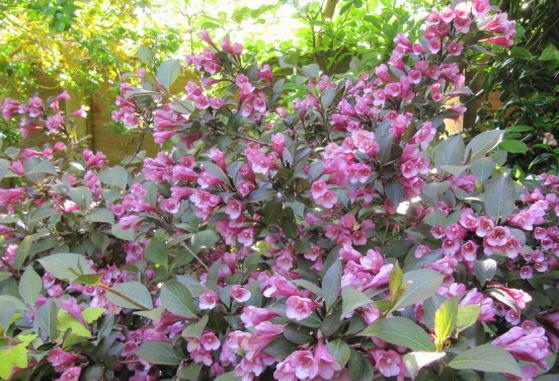 It will take from ten to twenty years for Weigela plants to attain full height. Requires annual pruning. 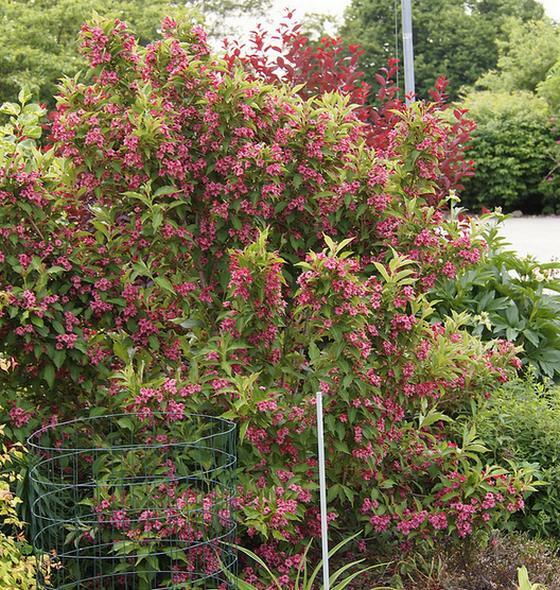 This will prolong the life of the plant, encourage more vigorous growth, and keep the Weigela plant tidy. Pruning should be carried out immediately after flowering. The flowered growth should be pruned to the level of the stronger, younger shoots. Furthermore, 20% of ageing stems should be cut-back to close to the plant's base annually. Also, cut back damaged and diseased parts completely; thin out any overcrowded shoots to ground-level; remove weak and misshaped shoots. Pests and diseases are not usually a major problem for Weigela florida, but it may be affected by eelworms and honey fungus.